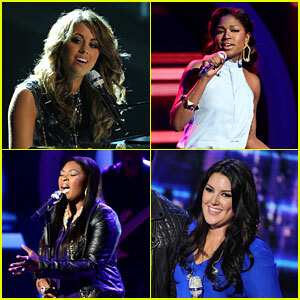 Highlights from the American Idol Finale and Congrats to Candice!!! For further proof of Candice’s brilliance, check her out dueling with Oscar and Grammy winner Jennifer Hudson on “Inseparable” below. It was the stunning highlight of the finale broadcast and let me tell you, it was even better live! And while Candice had the best number of the night with that one, there were some other great collaborations. First I loved the duet from third place finalist Angie Miller (who is due to sign her record deal this week too) and Grammy nominated Idol alum Lambert on “Titanium”. It was beautiful and the harmonies were amazing…. Angie followed that up with the raucous duet with Jessie J on “Domino” that was awesome too. Seriously Jessie J is incredible. Another shocker favorite performance for me was from 5th place finisher Janelle Arthur who rocked some serious hair-ography with The Band Perry on their current hit “Done”. It was so good. So, that’s it for season 12 of American Idol. I loved all the girl power this season and congratulations to Candice! Let’s hope next year, we get another great winner along with some new theme nights and better judges too. (Sorry Nicki was a mess. Mariah was lovely but long-winded and buh bye to the Dawg Randy Jackson after way too long on the panel.) In the meantime, please enjoy Candice Glover’s first official hit “I Am Beautiful” below. American Idol Season 12 Finale Quick Wrap 5/15/12~ Help Me Now I’m Torn! “Help Me Now I’m Torn”! Those are the incredibly catchy lyrics from Natalie Imbruglia’s 90’s smash, but they also define my feelings after watching tonight’s American Idol season 12 finale. In a nail biter of an episode, both of our incredibly talented ladies, Kree and Candice, delivered fantastic performances one after the other. Both sounded amazing, looked great, were humble and at the top of their game as they took on 3 songs: Simon Fuller’s Choice, their Single, and a “Favorite Encore” from the season. It was neck and neck up until the last song when one lady sang what I will say was the deciding vocal. However, in a year when supposed front-runner Angie got the surprise boot last week and left us with the two actual best singers in the finals, who knows who will actually win. Both women have a really good shot… But, let’s take a look at my rankings and final predictions for season 12 below and declare a winner. 1. Candice- “I Who Have Nothing”: from the opening a capella verse to the insane final notes, Candice’s reprise song was a capper to an incredible season for the singer who had more “moments” than anyone else all year. And this was arguably her best. It was simply brilliant beautiful and bold. Simply amazing. And further props for changing up the arrangement yet again Candy Girl! 2. Kree- “Up to the Mountain”: with her best vocal of the night and arguably, the whole season, Kreedom rose into the heavens on this one. It was glorious and ethereal and surpassed her previous version by leaps and bounds. As Keith says, “just beautiful”. 3. Kree- “All Cried Out”; forgive me but I was a bit cried out at the end of this lovely new single. The sentiment and Kree’s aching vocals really got to me. This could totally be her “Jesus Take the Wheel” and fly up the country charts. This kind of song and performance is just what got me so torn. In fact, Kree really made me emotional in all of her performances tonight and that could totally push her over the top. This single is also a much more marketable one than Candice’s. 4. Candice- “I Am Beautiful”: yes, you are beautiful Candice and so are your amazing pipes. While this song was a little more pop than the R&B sweet spot I like Candice in, it still was a good choice for her and a great vocal. I wonder how this one will do as an actual “single” but It certainly has potential. 5. Candice- “Chasing Pavements”: taking on Adele’s first hit, Candice delivered another winner. She changed up the phrasing and arrangement enough to make it feel like her own song and she sang it beautifully. It was just a little sleepy compared to her other two numbers. 6. 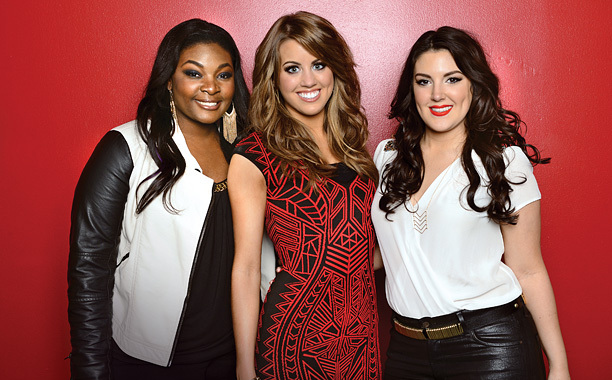 Kree- “Angel”: with an angelic (yes I said it) vocal on Sarah McLachlan’s weeper, Kree totally wrecked me. While the song was a little sleepy as well, her emotion was so on point and her voice so perfect, it really left me a little weepy. Wow~ 6 Incredibly performances. How can I choose a winner? Ok, I’m just gonna call it…. And there you have it. 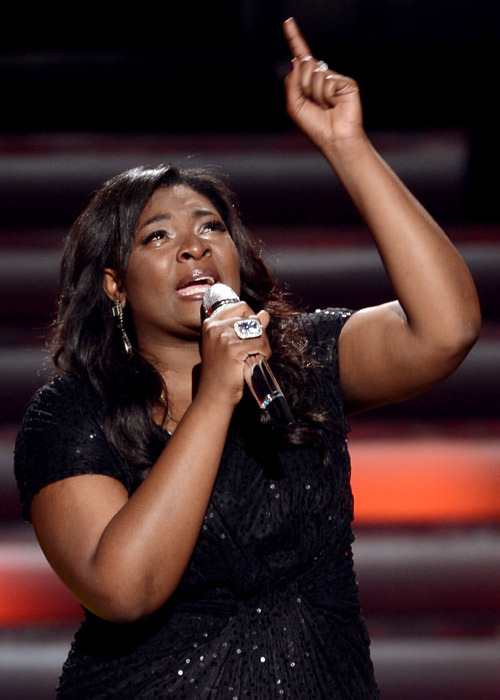 I’m ready to crown Candice Glover the season 12 American Idol. Are you? Will America pick the actual best singer this time? (I’d say only Kelly and Carrie were the actual best singers of their entire seasons, so Candice would be in great company.) Will Kree pull an upset and land us another Texas winner? Will Candice become the first returnee contestant to win? … Who knows? It’s gonna be really close and I could see either lady win. In fact, I’m predicting it will be the closest finale since Ruben/Clay in season 2. I also think both women have very good careers ahead of them. I can’t wait to see who what they do and, of course, who wins. Find out tomorrow on American Idol. With ratings declining for American Idol (despite the best top 5 singers in the history of the show) and no new breakout smashes (The Following was their biggest newbie last year), Fox has some work to do to regain the ratings race. We’ll see what that means in terms of new judges on the returning X Factor and Idol which will say goodbye to Randy Jackson. And we will see if any of their new shows like Rake featuring Oscar nominee Greg Kinnear can break out big next year. 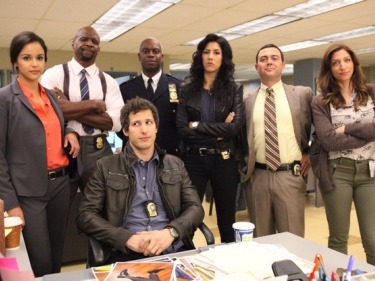 My bet is that the new cop comedy Brooklyn Nine Nine has the best shot. It’s preview is pretty hilarious. With that said, take a look at the new fall 2013 Fox Schedule below, and for more on the new shows and previews, head to Fox and TVLIne here. Coming at midseason: GANG RELATED (new crime drama set in the LA gang scene), SURVIVING JACK (new family comedy with Chris Meloni), US & THEM (new ensemble comedy with Jason Ritter and Alexis Biedel) and MURDER POLICE (new animated cop comedy). Tonight, the best top three singers in the history of American Idol performed admirably thru many vats of tears on arguably the best episode of the season to date. Not only were their songs bringing us to tears but the annual home town visits were showcased and that was a serious bawl-fest. Whether it was the “Boston Strong” signs Angie witnessed or Candice‘s massive family displaying their incredible joy or the heartbreak of visiting Kree’s home where she grew up with her late parents, there wasn’t a dry eye in the house. And that includes my house where I was a blubbering fool…. 1. Candice- “Somewhere”: tackling the iconic ballad from West Side Story, Candice absolutely slayed the monster with a version that rivals Barbra and Broadway’s best. It was simply amazing. Her vocals were rich with piercing emotion and soaring notes that not only transported us to a different plane but made the song seem new and fresh.I was crying and giving a “Standing O” alongside the judges. It was arguably the best “moment” of the season to date. FYI~ the other best “moment” of the season was Candice’s “Love Song”. Somebody absolutely deserves to win this competition with her insanely good performances and that someone is Candice! 2. Kree- “Here Comes Goodbye”: singing the Rascal Flatts hit (co-written by American Idol alum Chris Sligh), Kree gave her best performance of the season. It was a glorious and emotionally wrenching vocal that had me in tears. If she records music this good with this amount of feeling, she will have a big career ya’ll. Just wonderful. 3. Angie Miller- “Sorry Seems to Be the Hardest Word”: delivering Elton John’s classic ballad with a surprising amount of heart and subtlety, Angie gave her best performance of the night. Shockingly I agreed with Randy that the verses were the best part and her simplicity there really connected with the emotion perfectly. Angie is a pro and so comfortable in front of or behind the piano. Well done. 4. Candice- “One”: Candice hit it out of the park again on U2’s glorious anthem. Her emotions were on point and the vocals really cut to the core of this aching rocker. Candice showed she can sing any genre yet again tonight and with this rock track, I’d love to see her venture into this genre on her debut album. So good! 5. Angie- “Try”: holy crap, I have to admit it. I believed Angie the rock star tonight as she truly rose to the occasion on P!nk’s recent top ten smash. Her voice fit the song perfectly and she had such confidence and swagger on the stage. She really is the whole package now. 6. Candice- “Next to Me”: with this soaring and sultry version of Emeli Sande’s current hit, Candice showed how she can be a contemporary artist and still smash the hell out of the vocal. It felt like it was her very own song and I loved how she played with the riffs at the end. 7. Angie- “Maybe”: I’m sure most people didn’t know this Emeli Sande song before tonight, but I bet a bunch of you went straight to iTunes and bought it after hearing Angie’s lovely interpretation. (Seriously, I’m living for all things Emeli Sande right now!) It’s the perfect kind of song for Angie to sing and record. Another fine job. 8. Kree- “Better Dig Two”: singing the recent # 1 country hit by The Band Perry (co-written by my fiend Shane MacAnally), Kree was able to let loose a bit and have fun. I could see her record something like this in the future. However, on a night of great performances, this one just seemed average. I did love seeing Kree have fun on an uptempo number though. 9. 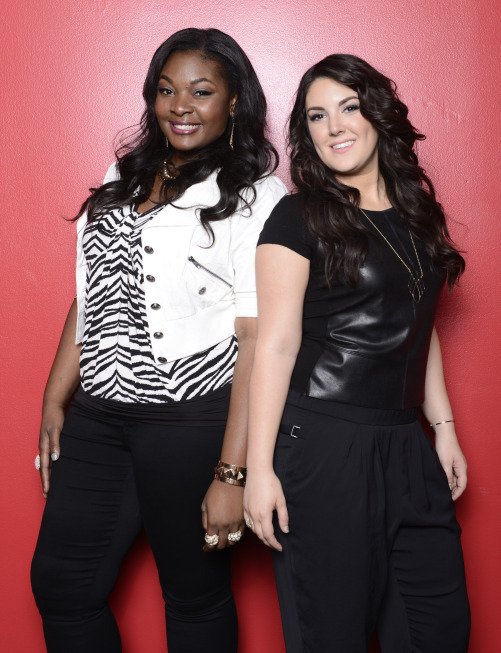 Kree- “Perfect”: I have to agree with Kree that this # 2 smash from P!nk wasn’t the right fit for her. While her voice sounded great, especially on the countrified first verse, the song just felt a bit off. I do love that Kree focused on the positive message of the song and she certainly delivered that sentiment well. Sadly, I think this is the end of the line for our kind-hearted and full-voiced country girl Kree Harrison. She’s a true authentic singer and artist and I can’t wait to see what she does in the future…. However, if I’m wrong and she makes the finale, I’ll be surprised and excited. But who would she replace? At this point I don’t really think she can take down Candice or Angie…. We’ll find out tomorrow night on American Idol.… Oh and on a side note, I have to applaud the judges for their most civil and least long-winded judging of the season. I wish they had been like this all year! And just because I had to watch it like 10 times in a row, I’m gonna share it with you again. Check out Candice’s astounding performance of “Somewhere” below. My favorite singer, and easily the best vocalist, from last season’s American Idol, Jessica Sanchez wound up in second place to the very successful Phillip Philips. However, Sanchez is doing her best to make her mark on the business with a just-released debut album, Me, You, and the Music and a big guest appearance on Glee. Sanchez hits the musical dramedy for its season finale playing Frida Romero, a big voiced diva from a rival Glee club. She will be performing the current top 40 pop hits “Wings” by Little Mix and “Clariy” by Zedd. I can’t wait to see her unleash those massive pipes on the Glee kids Thursday night on Fox… In the meantime, you can check out her great new album full of pop and dance tracks in stores and digital outlets now. It will make its debut on the Billboard 200 tomorrow in the top twenty as well. For more on Sanchez, head here and check out a preview of her appearance on Glee below. And here’s Jessica’s current hit single featuring NeYo, “Tonight”. Enjoy! Sorry for the delay on my post about the biggest hits in music this week, but I’ve been dealing with some “real” work stuff as my short comedy Dirty Talk continues across the festival circuit. (We just played Boston and won the Audience Award at the Miami LGBT Film Fest!!) … But back to the music world, Grammy winner Michael Buble nabs his fourth # 1 album as To Be Loved debuts atop the Billboard 200 Albums chart. He holds off fellow Grammy winner and American Idol winner Fantasia who lands at # 2 with Side Effects of You, her third top ten album and second # 1 R&B Album. Also debuting in the top ten are alt-rockers Phoenix, metal head Rob Zombie and Will.I.Am with a slightly disappointing #9 debut for his latest. Take a look at the full top ten below and head to Billboard for more on all the Albums charts. You saw P!nk‘s long running hit album hanging on for another week in the top ten above, and a big reason why is the third top ten smash from the album “Just Give Me A Reason” featuring Nate Ruess which holds on to the top spot of the Hot 100 Singles Chart for a third week. She fends off a strong charge by Macklmore & Ryan Lewis and will have to face some new competition by Swedish dance duo Icona Pop who charge into the top ten with their fist top ten hit “I Love It”. Take a gander at the new top ten below and head to Billboard for all the singles genre charts here. And here’s Michael Buble’s new single “It’s A Beautiful Day” from his new chart topping album To Be Loved. 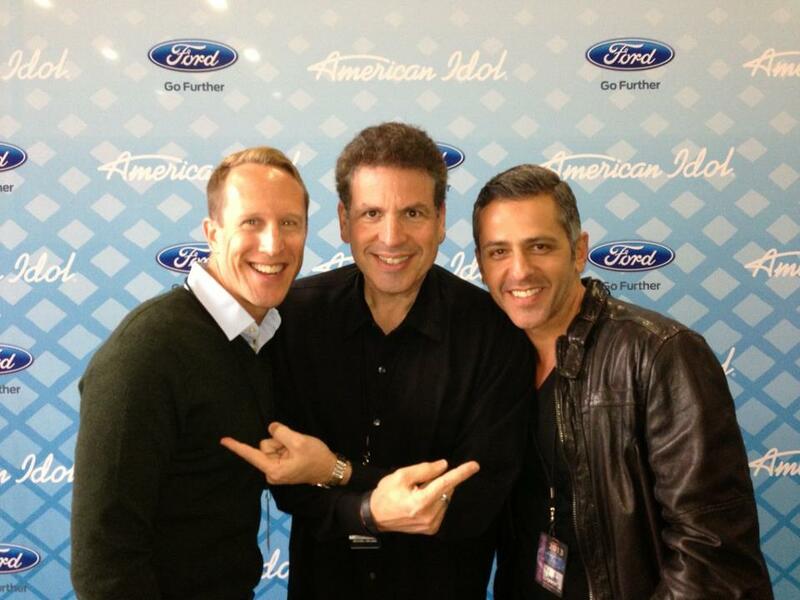 American Idol Quick Wrap 5/1/13~ May Day May Day! As, I was watching last night’s American Idol, I kept screaming at the TV: “May Day, May Day”! No, not just because it was the first day of May, but because the top four were crashing throughout the vocal battle last night. Well, ok, 3 of them were crashing at times, because Miss Candice Glover seriously killed it on both of her songs. The fierce four sang “Songs from 2013” with surprisingly blah results and the over-worn theme of “Standards”. Unfortunately, Angie, Amber and Kree all seemed a little tired or defeated and you could see that this long journey is starting to get to them with tons of stress and pressure. And while that was apparent, in a few of their numbers, the ladies voices were glorious as always… I wish I could say the same about the judges who were battling each other again. I’m sorry but I think Mariah may have to get the boot alongside the incredibly annoying Nicki and useless Randy next year. And, um, while Harry Connick Jr gave good advice and was an amusing mentor, his hard criticism really defeated the girls and he sounded like a real jerk at times. However, in the long run, he actually could be a really good and honest judge should the producers consider him for next year… And while they contemplate that, let’s take a look at my rankings and predictions for last night. 1. Candice- “You’ve Changed”: with the best vocal and performance of the night, Candice simply killed it on this beautiful standard. She made the song seem current and infused it with the perfect mix of emotion and heartbreak. Astounding. 2. Amber- “My Funny Valentine”: reprising the song that got her into the top twenty, Amber changed it up a bit and gave another flawless vocal. It was a beautiful and heart-tugging performance that stands as one of Amber’s best to date. I really hope she can pull out a miracle and make it another week with pipes as amazing as hers. 3. Kree- “See You Again”: with what I consider the most emotionally connected performance of the night, Kree brought me to tears on her cover of Carrie Underwood‘s new hit. I wish it had just been her and the guitarist because she could’ve had an “Idol Moment”, but it was still a great performance and Kree’s best in weeks. 4. Candice- “When I Was Your Man”: tackling Bruno Mars’ recent # 1 smash, Candice delivered another solid performance. She really connected with the audience and made the song sound like it was written for a woman. She’s not only a supreme singer but a great storyteller. 5. Kree- “Stormy Weather”: while her vocals were strong and the song started out good, it just left no impression and fell flat. Kree really never quite connected to the song and her bluesy tone was lost as she followed Harry Connick Jr’s advice. (He steered her wrong despite his smart advice on the standards for the other ladies). That said, it was one of the better of the “Standards” half of the show. I just wish the judges and Harry hadn’t highjacked the whole critique section and made a mess of things. 6. Angie- “Someone to Watch Over Me”: while the production of the song was overwrought , Angie’s vocals were clear and lovely. There were some standout moments that were a nice counterpoint to her over-singing in the rest of the song. And she did look gorgeous, but it was a little forced and Disney-fied and that finally note was so out-of-place and obnoxious. 7. Amber- “Just Give Me A Reason”: my girl Amber faltered on the current # 1 song in the nation by P!nk and Nate Reuss. Her vocals were fantastic of course, but she seemed lost otherwise. She was stiff and in her head. Also, this is clearly not a song that she would record and you could see it in her unconformability. I just wish she had done Rihanna’s “Diamonds” instead of Angie. 8. Angie- “Diamonds”: I’m sorry, but this was not good. While Angie sang it well and has a great voice, her interpretation of the song turned it into a bad jazz club joint and lost all the meaning and heat of the song. It was all kinds of forced and her fake pleading to the camera did her no favors either. 9. The Top 4 -“Wings”: um, what was that? No introduction was provided or explained for the ladies singing the new top 40 song by UK X Factor girl group Little Mix and it just felt weird. Also, none of them got to showcase their vocals and there were dancers and pyrotechnics that took away from our talented top four. Uncle Nigel and the Idol Producers, what the hell was that? * However, this is a crazy week in Idol history as fourth place is where we saw shocking boots for Chris Daughtry and Tamyra Gray. So, with that in mind, I wouldn’t be shocked if Angie fell into the bottom and got the boot. She did go first and was not very good last night, so it wouldn’t be too much of a surprise if she suddenly lost support and fell victim to the fourth place curse. But you know she got a ton of votes last week so, we will see. So, there you have it. The ladies faltered a bit as we’re nearing the end of a long and exhausting race. America’s votes from the last two weeks will be combined for tonight’s results and Amber may finally be in danger (boo!). But, could there be a shocking elimination? As long as it’s not Candice, I will be able to handle it. Will you? Let me know who your favorites are below and watch the American Idol results tonight on Fox. 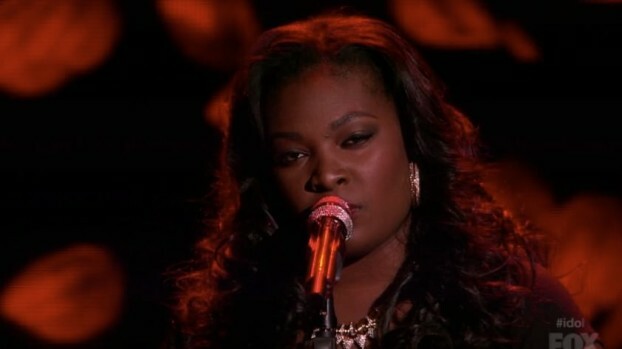 All Hail Candice Glover…. If there were any justice, American Idol would just hand Candice the season 12 crown and be done with it after tonight’s double dose of amazing performances. Not only was she flawless on both songs, her cover of “Love Song” was easily the best performance of season 12 hands down. I’d argue it’s in the top ten and possibly top 5 best Idol performances EVER! So, on a night when one woman threw down the gauntlet so hard, how is it that another singer gave arguably the worst Idol top ten performances in the history of the series? Yes, I’m takin’ bout Sassaro people. It was that bad… But wait, I’m getting ahead of myself. Let’s start by ranking all of tonight’s performances and looking at my predictions for who will get the boot home as the top six sang “Songs from the Burt Bacharach/Hal David Songbook” (i.e. : pretty but really old adult contemporary songs) and “Songs They Wish They Had Written” (i.e. : songs they know really well that require less memorization). 1. Candice- “Love Song“: giving an astounding performance on this Cure classic in the vein of Adele’s recent cover, Candice was perfection. As I said before, this was the “moment” of the season and will go down in Idol history as one of the best performances ever. It was insanely good. Tears! Standing “O”! Just Beyond! 2. Candice- “Don’t Make Me Over”: Nicki (who shockingly didn’t bother me at all tonight) said it well tonight that Candice’s performance of this song was so hot and current that you wouldn’t know it was written more than four decades ago. It was pretty damn flawless as well. Her vocals and inflection are just delicious! 3. Kree- “Help Me Make it Through The Night”: the girl I still think has the best shot to actually win the competition was in fine form again tonight and this performance of the Kris Kristofferson classic was just gorgeous. The emotion that you can hear in her voice is achingly good and she it was such a wonderful effortless performance. It could be a country hit today too. 4. Kree- “What the World Needs Now”: Kree’s take on this Bacharach/David tune was simple yet sublime. It hit all the sweet spots in her voice and she executed it with fabulous precision and heart. 5. Angie- “Love Came Down”: returning to her piano playing glory, Angie was also in her comfort zone on this faith-based ballad. It was a very pretty performance and really spoke to Angie’s true emotions marking her most resonant vocal in weeks. If she goes down the Contemporary Christian route after Idol, she will have a great future with songs like this. 6. Amber- “I Say a Little Prayer”: with the first of two uptempo songs from my favorite little dark horse, Amber delivered another solid vocal on this classic. It was fun and at times fierce. 7. Amber- “Love on Top”: speaking of fierce, Amber took on Beyonce and did a pretty darn good job on this incredibly difficult-to-sing song. It’s a great example of the kind of contemporary music our little Whitney-in-training could make. Another strong performance. 8. Janelle- “The Dance”: with a lovely subdued take on the Garth Brooks’ 90’s smash, Janelle did a fine job, especially on the first half of one of my favorite karaoke songs. However, she tried to make the song bigger than it is in the second half losing a little bit of the true meaning of the song. 9. Angie- “Anyone Who Had a Heart”: singing the Dionne Warwick hit, Angie showcased her great pipes with a very strong vocal. However, she did it with zero emotional connection and in an overly-dramatic and inauthentic style. 10. Janelle- “I’ll Never Fall in Love Again”: it was a nice vocal, but overall a little bit of a snoozefest and while I admired her for trying to “country-fy” the song, it didn’t really work. 11. Lazaro- “Angels”: well, let’s see… he didn’t ruin Robbie Williams biggest hit and he didn’t sweat as much as usual… But honestly, that was pitchy and boring. And his outfit was a bloody mess~ seriously. 12. Lazaro- “Close to You”: ok, I’m sorry but Sassaro’s performance of “Close to You” was an incomparable train wreck. It was horrifyingly bad in every way. He was off the beat, pitchy, mumble-mouthed and disconnected. He was just lost and it was a unequivocated disaster~ easily the worst top ten performance by any finalist in the history of American Idol (and that includes Sanjaya!). Sorry Sassy, but you gotta go! Going Home: Janelle… but not really. I think the judges will use the “Save” for her (or Amber if it comes to that) because this week is their final week to use it…. That said, if America does the right thing and boots Lazaro, the “Save” will not be used. And there you have it. It was a night were Candice was crowned the Queen and Sassaro should’ve been sent to the gallows. It’s kind of shocking how enormous the disparity between those two singers is, but this is American Idol. So, America, please get it right and make the first all female top five tomorrow night and send our tight pants wearing Ricky Ricardo on his way. And just because you know we all need to see it again, take another look at Candice’s transcendent performance of “Love Song” below.